Unlimited Motion Protective Elbow/Knee Gel Pad is designed with a medical grade gel cushion that contours around the heel, elbow or knee to protect the area from pressure, friction, and shear forces. The gel pad gradually releases mineral oil to moisturize and soften the skin. This product is washable and reusable. Also a great knee pad for smaller children. Small/Medium size perfect for children ages 5 - 12 (or small adult). Sleeve unstretched measures 3 inches wide at elastic. This size is also perfect for knee pads on children ages 3-8. Large/XLarge size will fit small adult up to large adult. Sleeve unstretched measures 3.5 inches wide at elastic. 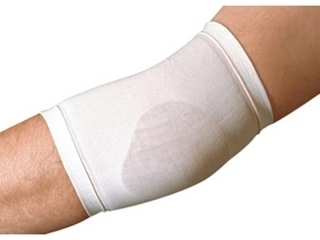 Cushions and protects the elbow against impact, pressure, and abrasion.